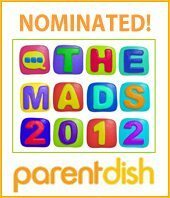 We’ve been nominated as Best Small Business Blog in week 1 in the MAD Blog Awards which is fantastic. Thanks so much for your support and for getting us this far. I do need more nominations. There I’ve said it now. It’s out in the open. Maybe I shouldn’t have said it. That’ll probably mean everyone will panic nominate us now I’ve said it. So if my posts make you smile, touch a chord, or you would like me to shut up and stop begging, then please nominate me using the badge on the left or right for the Best Small Business Blog. Incidentally, I also know someone that makes gorgeous home-made chocolates. So I am definitely worth getting on the good side of. KiddyCharts would like to apologise for the panic nominations that this post might precipitate. Please accept our apologies for any upset or disruption this may have caused you and your family. In addition, this post contains unashamed begging and dangerous sarcasm. If this has offended you in any way, we would also like to apologise. Right, enough of that, lets all have a nice sit down together for a cup of hot chocolate and a hobnob. Pingback: Love All Blogs » the altruistic blogging network and showcasing site that welcomes all bloggers » Panic nominate now!